With the Apple iPad 2 set to touch down in the UK from 5pm this Friday, March 25th, the king of gadget tinkering Stuart Hughes has revealed his latest creation, a gold covered second-gen iPad worth £5 million. Branded the 'iPad 2 Gold History Edition', Hughes' latest blingged-up gadget does away with the iPad 2's black or white front and brushed aluminum backing instead donning a shiny coating of 24ct gold, shaved T-Rex dinosaur thigh bone, a 8.5ct flawless diamond and sections of Ammolite, the oldest rock the world has to offer. Self proclaimed as “undoubtedly the world's most unique gadget,” the iPad 2 Gold History Edition is limited to just two units with the 24ct gold backing adding 2,000 grams in weight to the iPad 2's slimmed down form factor. 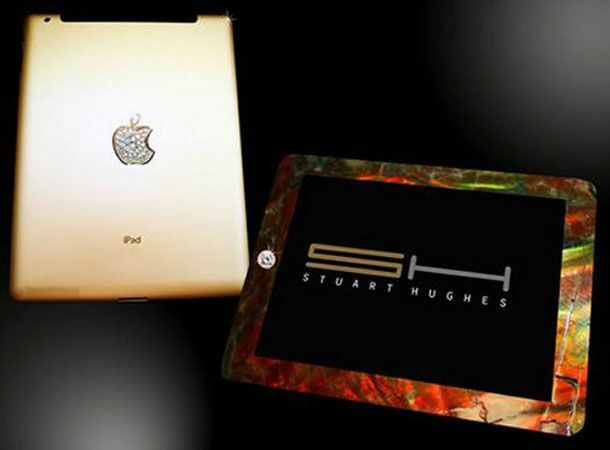 Adding to the already somewhat garish 75 million year old Canadian Ammolite and gold exterior Hughes has finished the extravagant £5 million iPad 2 with a 24ct solid gold Apple logo topped off with 53 individually set gems. Will you be opting for the standard £399 iPad 2 or the hefty £5 million gold option come Friday's official launch day? Let us know via the T3 Twitter and Facebook feeds.